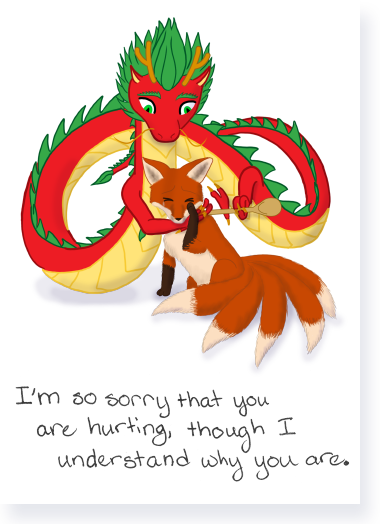 Spoon Dragon comforting its kitsune friend in a time of hardship is here to say the words you can't always come up with. Many of our cards have genderless chibi figures, so at first the card was going to feature two of them hugging from behind. But Ariela had been toying with the idea of making some of our cards feature other recurring characters, so she decided to use the spoon clutching dragon (herein after referred to as Spoon Dragon) from the Take Care of Yourself card. Ariela briefly considered drawing Spoon Dragon by itself, crying, before remembering that the point of a bereavement card is to offer comfort, and that image would be really counterproductive. Her sister actually said “Nooooooo! That would be so sad!” So instead, she decided to show the Spoon Dragon comforting a friend. I threw out a few suggestions (including, but not limited to: sea serpent, The Loch Ness Monster and a vampire squash), but Ariela wisely chose a kitsune as the dragon's friend. The kitsune is a Japanese fox spirit. Kitsune are usually portrayed as having between one and nine tails, with more tails generally corresponding to greater age and power; traditions vary. This kitsune has five tails, one of the more common numbers below nine. Ariela wanted to make it clear this was a magical creature, hence more than one tail, but that it is not quite as wise or all-knowing as a nine-tailed kitsune*. The interior text was really difficult to compose. We wanted the card to be able to convey a general feeling of sympathy (especially the kind you feel when someone you care about loses someone they care about), without it sounding like a Hallmark platitude. I often find that in situations like this, many people sound a lot less comforting than they think they do. We both wanted to avoid that, while also having a card text that would appeal to a large group of people. We hope that it accomplishes that. Like all of our cards, the Sympathy Card is available singly for $4.00 and as a pack of 6 for $20.00. © 2015, Ariela Housman. All Rights Reserved.